The trading prices of industrial metals like copper are often used as an economic indicator for the cost of procurement and production in the manufacturing industry. After growth reports from the sector came back positive, copper futures were trading for higher than expected on Thursday, according to Bloomberg. September copper futures remained at $3.1855 a pound, after increasing by 0.2 percent for its fifth consecutive gain. "We have a weakened dollar and a good durables report, and that's bullish," Michael Smith, president of T&K Futures & Options, said to Bloomberg in a phone call. "Copper reflects the economic outlook, so the market is paying attention to news like this." Since the price of copper is determined by the strength of the dollar, a weaker dollar is seen by foreign investors as an opportunity to buy more copper. Previously copper futures were projected to have lower trading prices because China began to slow its purchasing. Prices saw a boost after signs emerged that showed the manufacturing industry was gaining back its strength. The Department of Commerce recently reported new orders for manufactured goods increased 4.2 percent to $244.5 billion in June, according to The Wall Street Journal. Economists originally projected new orders grow only 1.7 percent. "Durable goods orders beat forecasts, which caused a turnaround in prices," Matthew Zeman, senior market strategist at Kingsview, said to the WSJ. With these positive economic reports, the price of copper might grow as demand for manufacturing goods grows since copper is considered one of the most valuable metals. Manufacturing heavily incorporates the material in its production supply chain, including in electrical wires, tools and pipes. 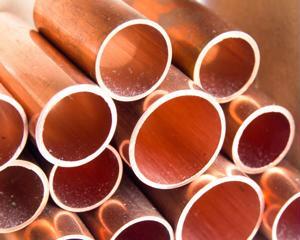 The direct materials cost for copper might increase as a result of expanding demand for more goods.